Spring 2012 Concert Round Up! Okay, I’ve been super busy building things and making music that I haven’t had the chance to really sit downa nd go over the concerts I hit up this spring. Believe it or not, there was plenty of acts to roll on through Austin after SXSW to keep my bill full. So, instead of bangning out an individual post for each, I will shoot through them with highlights. Bang. Bang. Okay first up was seeing Washed Out and boy the name did not disappoint. The last time I saw a show this soaked with rain, it was at Ozzfest in Kansas City about a decade ago. Yes, it rained like cats and dogs in the middle of the ste. Dog Bite opened up and were decent. 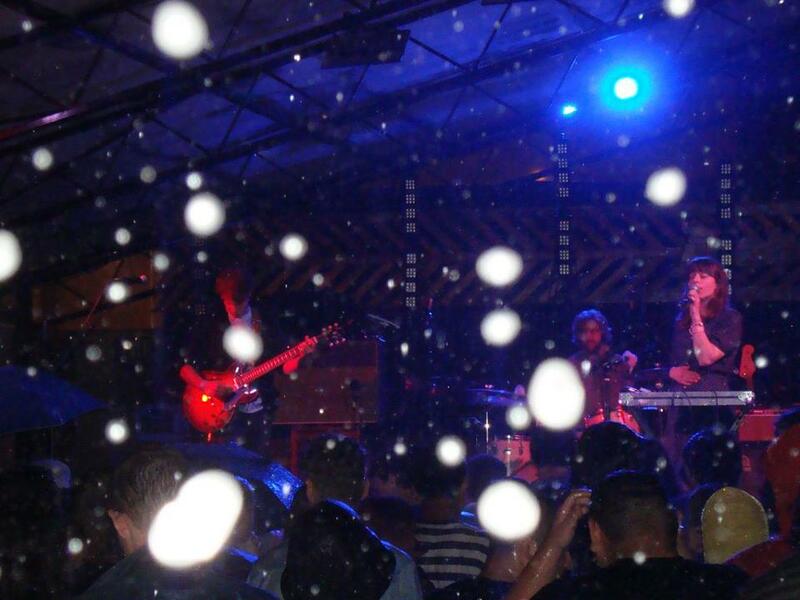 The rain poured hard during Memoryhouse but they kept up the high spirits. Washed Out rung out the rain and ended up with melting my mind a bit. I couldn’t hear the lyrics too much for the songs, but I guess you expect that with those guys. Next up was a band on my “90’s/200’s Groups I Was Too Broke To See But I’d Like To Someday” list. Spiritualized zoned out Emo’s East and I’m glad I picked this one time to see them. Their latest album was refreshing and memorable, where as the last couple I don’t remember. Nikke Lane opened up and was about as Southern and acousticy as you can get. She was opposite most ways of Spiritualized but connected on the soulful parts. Electric Mainline is my jam by the way. Speaking of jams, tUnE-yArDs showed up at The Mohawk. I lucked out and scored the raffled, randomed tickets to see their Austin City Limits taping but we followed it up the night after for a real beat down. Deep Time opened up for the group and I nabbed on tape their one song, “Clouds.” The African undertones with what tUnE-yArDs does on top of the layered song building is what really attracts me to their music. WHAT’S THAT ABOUT? WHAT’S THAT ABOUT? Lastly, I sent it home at Emo’s East again and Best Coast. What better way to kick off my summer than to hear about how awesome California is without actually being there. Love songs are always better than reality. Apparently they also closed out the Chaos in Tejas music festival, becuase Austin has one every week now. So we were treated to the likes of the Mind Spiders, Lemuria, and Laura Stevenson and the Cans. Out of that bunch, I would say that Laura Stevenson had my ears tingled the best. Best Coast finished my Spring off on top with their hit ‘Boyfriend’ and it couldn’t have ended better. So that was my Spring time jam. I have a whole Summer series mapped out with tickets purchased. I’ll clue y’all in to what the goings on will be soon enough. Tonight kicks it off with Beat Connection. Until then, I’ll be in the studio, either making new music or trying to author a video showcasing this cool music box thingy I built. Tune in sooner or later.